In this tutorial, we'll show you how to use Twilio's Programmable SMS to send SMS and MMS messages from your Node.js application. The code samples in this tutorial use Twilio's Node helper library. Let's get started! Before you can send messages from the Twilio API, you'll need a Twilio account and a Twilio-powered phone number. If you're brand new to Twilio, you can sign up for a free trial account to get started. Once you've signed up and selected a project (the "Learn and Explore" template will work for this tutorial), head over to your Console and get your Account SID and Auth Token. You will need those values for the code samples below. If you’re using a trial account, you will need to verify your personal phone number via the console so that you can test sending SMSes to yourself. Learn more about how to work with your free trial account. 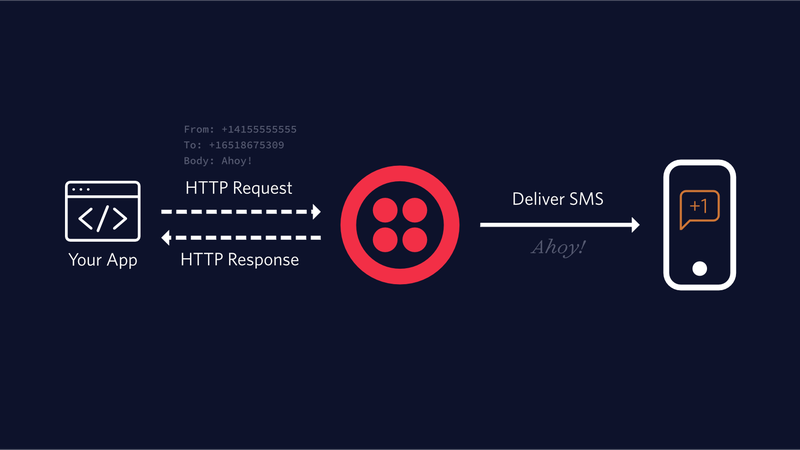 To send an outgoing SMS message from your Twilio account, you'll need to make an HTTP POST request to Twilio's Message resource. Twilio's helper library for Node.js helps you create a new instance of the Message resource, specifying the To, From, and Body parameters of your message. This will install the twilio module so that Node.js scripts in the current directory can use it. Now, create a file named sms.js and include the following code. Replace the placeholder values for accountSid and authToken with your unique values. You can find these in your Twilio console. Please note: it's okay to hardcode your credentials when getting started, but you should use environment variables to keep them secret before deploying to production. Check out our blog post "Working with Environment Variables in Node.js" for guidance. You'll tell Twilio which phone number to use to send this message by replacing the from number with the Twilio phone number you purchased earlier. Next, specify yourself as the message recipient by replacing the to number with your mobile phone number. Both the from and to parameters must use E.164 formatting ("+" and a country code, e.g., +16175551212). We also include the body parameter, which contains the content of the SMS we're going to send. Let's take a moment to understand what's going on behind the scenes when you send this request to Twilio. You can access any of these attributes from your Node.js code, much like we did when we logged the message.sid. Try updaing the existing logging statement in your code to be .then(message => console.log(message.status)) instead. Save the file, then run the code again. You should see the status of your message, "queued", printed to your terminal. If you’d like to track the status of your messages in real-time, you’ll need to set up a StatusCallback URL. Learn more in our tutorial on confirming message delivery in Node.js. To include media in your Twilio-powered text message, you need to make an addition to the code we wrote above. This time, we need to add the mediaUrl parameter. Again, update the from and to parameters to use your Twilio phone number and your mobile phone. The new mediaUrl parameter in this code tells Twilio where to go to get the media we want to include. This must be a publicly accessible URL: Twilio will not be able to reach any URLs that are hidden or that require authentication. When the Twilio REST API creates your new Message resource, it will save the image found at the specified mediaUrl as a Media resource. Once created, you can access this resource at any time via the API. Save the file and run your project. In just a moment you should receive a text message with an image and see the your new Media URI printed to your console. You've now successfully sent some messages with the Twilio Programmable SMS API and the Node.js helper library. Learn how to send an SMS during an in-progress call with Node.js and Express.